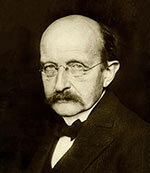 Max Planck (1858-1947) was a German physicist who is considered the father of Quantum Physics. He discovered that light could be emitted in particles (Quanta) rather than steady waves. This hypothesis over-turned many assumptions of classical physics, paving the way for many future developments in Quantum Physics. However, Planck was content to understand the general fundamental aspects of physics and was not intent on finding new discoveries. Planck received a doctorate of philosophy in 1879. He became an assistant professor of theoretical physics at Kiel from 1880 to 1889. He then transferred to Berlin University where he succeeded his former teacher Kirchoff. In addition to his teaching duties, Planck was able to undertake research into thermodynamics and the problems of radiation. His most influential research was into the distribution of energy emitted by a black body. He undertook this research partly due to being commissioned by electrical companies who wanted to create the maximum light from minimal energy. A black body, is an object which absorbs all light. His experimental observations showed that the wavelength distribution of energy was not constant but a function of temperature. The energy for a resonator with frequency v is hv. Physicists call these quanta – photons, and they have their own specific and unique energy. Planck was widely regarded as a conservative physicist, the fact that he came up with such a revolutionary theory and that he doubted it himself, helped to give it more credence. Despite Planck’s conservatism, he stuck devotedly to the data and facts he discovered, and this enabled him to see more clearly than other physicists who tried to marry the results to their expectations of classical theory. His work was summarized in two books Thermodynamik (Thermodynamics) (1897) and Theorie der Wärmestrahlung (Theory of heat radiation) (1906). Planck feared his results might undermine the whole of physics, but later he realised, it just moved the subject to a fuller understanding of the atomic and sub-atomic level. He said of his new theories. Further research in this field proved that Planck’s hypothesis was indeed correct. For example, Albert Einstein’s explanation of the photoelectric effect relied on the same model of quanta energy. Planck was one of the first scientists to see the importance of Einstein’s special theory of relativity published in 1905. Planck’s support was instrumental in seeing Einstein’s new theories gain widespread acceptance in Germany and the rest of the world. Einstein and Planck became good friends, and Planck helped Einstein gain a professorship in Berlin in 1914. Planck was awarded the Nobel Prize in Physics in 1918 in recognition of his contribution to quantum physics. It was widely regarded as a very deserved prize, but given the context of the First World War, it had a wider significance for illustrating science was beyond national boundaries. Planck retired from the University of Berlin in 1926 but remained active due to his increasing international profile. He was appointed the President of the Kaiser Wilhelm Society for the Promotion of Science and in 1926 was elected to foreign membership of the Royal Society. In 1887, Planck married Marie Merck, and they moved to an apartment in Kiel. They had four children. Marie died in 1909. Planck remarried her cousin Marga Von Hosslin, and they had one more child. During the First World War, Planck was initially an enthusiastic supporter of the war. In 1914, he signed the Manifesto of the Ninety-Three – an intellectual backing for Germany’s war effort and invasion of Belgium. (Einstein refused to sign). Planck would later revoke parts of the manifesto. In 1916, he signed a declaration against German expansionism. During the war, his son Erwin was taken prisoner by the French in 1914. His eldest son Karl was killed in action at Verdun in 1917. His two daughters, Grete and Emma both died from childbirth within two years. (1917 and 1919) He met these personal tragedies with stoicism. In addition to his renown as a physicist, Planck was a talented musician. He played the piano, organ and took singing lessons. At an early age, he considered a career in music but chose physics instead. During the Nazi rule 1933-45, Plank remained patriotic to Germany but was often critical of the behaviour of Hitler and the Nazi regime. He outraged at the way Jewish scientists were treated. However, under his leadership, the Kaiser Wilhelm Society avoided open conflict with the Nazi’s. Planck kept hoping the Nazi regime would moderate their behaviour. He 1938 he resigned the presidency when it became taken over by the Nazi regime. His position, age and international renown giving him more protection than other critics. Planck also suffered great personal hardship when his home was bombed by the allies towards the end of the war. Despite hardships of the war, Planck was eager to try and live to see a new international order rise from the embers of the Nazi regime. However, his closest son, Erwin was involved in the failed Hitler bomb plot of 1944 and was executed by the Gestapo in early 1945. This was a hard pill to take for the usually stoical Planck. Planck was a Lutheran Christian, and he adopted a liberal view towards other religions. He felt that as a physicist, God was the connecting link explaining the source of all matter and atoms. He was sceptical about some of the miracles attributed to religious belief and felt that the essence of religion was compatible with a scientific search for the truth. Planck loved walking in the European mountains. He remained fit into old age and it was one of his life’s great pleasures. He died in Gottingen on 4 October 1947. Although Planck was not directly involved in later developments in quantum physics, he made the most significant breakthrough which provided a theoretical basis for many of the developments which later came from quantum physics and our understanding of atomic and subatomic processes. In this regard, he can be seen as highly influential in the development of twentieth-century physics and science.